Sasheer Zamata knows how to win over a crowd. The 32-year-old actress and comedian, best known for her work on Saturday Night Live, performed a stand-up routine last Friday night as part of The Toronto Sketch Comedy Festival. Featured as one of the festival’s headlining acts, Zamata delivered a performance that was simultaneously sidesplittingly funny and lovably endearing. By the end of the show, she not only had me on the edge of my seat in anticipation for her next joke, but wishing that I could listen to her stories all night. In the hour that she was on stage, Zamata touched on everything from what she’s been watching on Netflix, to a recent STI scare, to fruit. As she effortlessly switched from one topic to another, she left the audience in stitches. When a comedian is able to have the audience howling with laughter while telling jokes about pineapples, you know you’re in the presence of a seasoned professional. 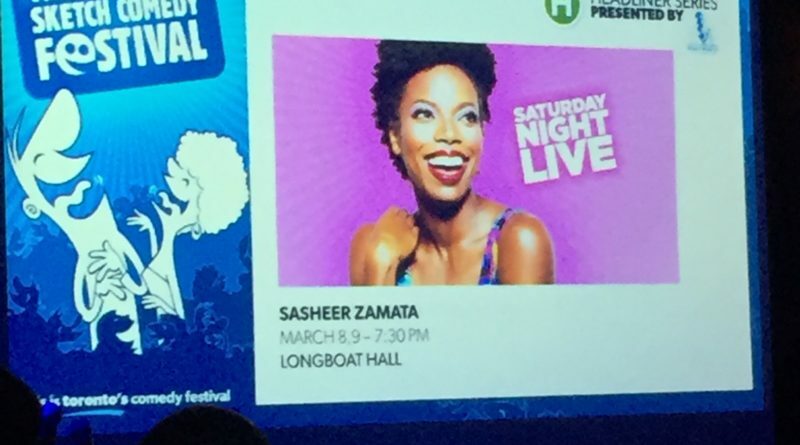 Performing for an audience of about 50, Zamata took the stage at Longboat Hall, the perfect venue for an intimate night of stand-up comedy. Watching Zamata perform was a privilege that I hope for anyone who takes the gamble of going to see a live comedy show. Casual, informative, and relatable, Zamata commands the stage. Listening to her stories was like catching up with a close friend over drinks, one whom you cant wait to see because you know they’ll have the craziest of anecdotes to share. The entirety of Zamata’s material was received warmly, with an uproar of raucous laughter accompanying every punchline. A testament to her natural talent, Zamata knows how to expertly set up a joke and then deliver it perfectly. I’ve always felt that a great comic is one who knows when to back off, let the audience breathe, and let them absorb the joke, a skill Zamata has mastered. Pair that with her quick-witted timing, and you have a show that was highly enjoyable from start to finish. Even jokes that were short and sweet were still a delight to listen to simply because of the level of charisma and enthusiasm with which Zamata delivered them. Given her success in the industry, you might expect a majority of Zamata’s material to consist of SNL tidbits and crazy Hollywood stories. Not the case at all. What’s so great about Zamata’s material is how relatable it is, proving that once again, the funniest things are often the truest. “If you’ve owned a dog, or a baby, or an old person, you’ve touched a lot worse,” quipped Zamata in reference to women who are squeamish about their period. Another bit that killed and got a big laugh from the audience was when Zamata riffed on how medical professionals seem to not take black women seriously when they discuss their illnesses. “A nurse asked me, ‘what are you in for?’ And I was like, ‘am I in prison?’” “Maybe if we (black women) make illness cool, white people will take it away from us,” mused Zamata. After having spent an hour in her company I now consider myself a full-fledged Sasheer Zamata fan. I not only excitedly look forward to her future endeavours, but am certain that the next time she comes to Toronto, I’ll be sure to buy a ticket to her show. If you’re looking to spend a night watching the epitome of entertaining stand-up comedy, I recommend that you pick up a ticket as well.